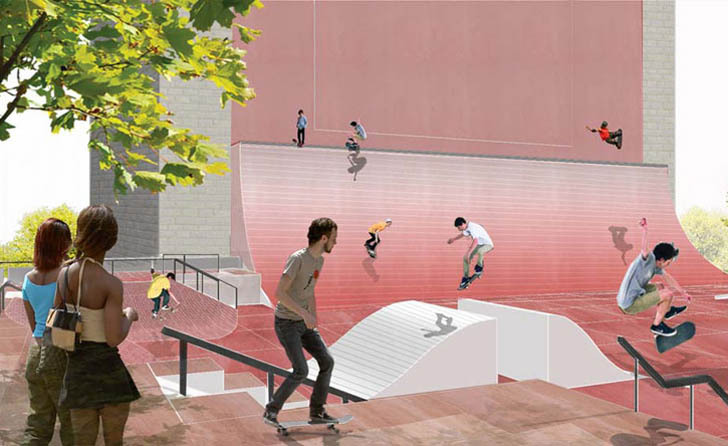 HAO Architects Win Coleman Oval Skate Park Redesign! The redesign proposal for Coleman Oval Skate Park that we brought you back in October will soon become a reality. HAO/Holm Architecture Office officially beat out eight other firms with their proposal for an exciting plan that will transform the park into a premier skating arena. The new park will be funded by Architecture for Humanity and a Nike Gamechanger’s grant. The already popular Coleman Oval Skate Park is in need of a major overhaul, as it is one of the most heavily trafficked parks by skaters in the area. HAO’s design will make the park the focus of the area under the Manhattan Bridge, which is located on the fringes of the Lower East Side and Chinatown. The project will be constructed in cohesive pieces, rather than making the entire site a closed construction zone at the same time. HAO’s plan was inspired by the diversity of the area and by the people that the park attracts. The neighborhood borders Chinatown, and also has a large Hispanic population. Along with the athletic skaters that come from far and wide, the area is popular with many walks of life. HAO wanted to create a new and innovative park that doesn’t only cater to the skater population, but also gives back to the Chinese and Hispanic locals as well and welcomes them into the park. The solution was to create an overall gaming atmosphere that can be enjoyed by all. Aside from a state of the art skate park, the new Coleman Oval will incorporate a playground, and a public park for local families to visit, with a dog run for local pooches. A baseball field will be open to the public, but also supported by a sports program for local youth. Stadium style seating will give visitors a relaxing view of the East River. The project plan that will perhaps most benefit the neighborhood is a large outdoor stage that will use the skate park’s basin as a sitting area. Movies, music, and markets are expected to take place in the stage area, which is flanked by a large wall entrance that will double as an urban gallery for artists. HAO’s exciting win is being made possible by a partnership with the New York City Parks and Recreation Departments Adopt-a-Park program. PEOPLE WHO DONT SKATE SHOULDNT BE ALOUD TO DESIGN SKATEPARKS! The already popular Coleman Oval Skate Park was in need of a major overhaul, as it is one of the most heavily trafficked parks by skaters in the area. HAO’s design will make the park the focus of the area under the Manhattan Bridge on the fringes of the Lower East Side and Chinatown. The project will be constructed in cohesive pieces, rather than making the entire site a closed construction zone over time. HAO’s plan was inspired by the diversity of the area, and of the people that the park attracts. The neighborhood borders Chinatown, and also has a large Hispanic population. Coupled with the athletic skaters that come from far and wide, the area is popular with many walks of life. HAO wanted to create a new and innovative park that doesn’t only cater to the skater population, but also gives back to the Chinese and Hispanic locals as well, and welcomes them into the park. The solution was to create an overall gaming atmosphere that can be enjoyed by all. Aside from a state of the art skate park, the new Coleman Oval will incorporate a playground, and a public park for local families to visit, with a dog run for local pooches. A baseball field will be open to the public, but also supported by a sports program for local youth. Stadium style seating will give visitors a relaxing view of the East River. The project plan that will perhaps most benefit the neighborhood is a large outdoor stage that will use the skate park’s basin as a sitting area. Movies, music and markets are expected to take place in the stage area, which is flanked by a large wall entrance that will double as an urban gallery for artists.